The cookbook suggests serving them golf-ball-size with polenta, but like Elisa we thought they were terrific on a roll with sauce and a slice of provolone. They’d also be terrific bite-sized for a party. Preheat oven to 450 degrees. Drizzle olive oil into a 9-by-13-inch baking dish and use your hand to evenly coat the entire surface. Set aside. Combine ground pork, salt, cherry peppers and liquid, bread and eggs in a large mixing bowl and mix by hand until thoroughly incorporated. Roll the mixture into round, golf-ball-size meatballs (about 11/2 inches), making sure to pack the meat firmly. Place balls in prepared baking dish, being careful to line them up snugly and in even rows vertically and horizontally to form a grid. The meatballs should be touching. Roast for 20 minutes, or until meatballs are firm and cooked through. A meat thermometer inserted into the center of a ball should read 165 degrees. Allow meatballs to cool for 5 minutes in baking dish before serving. Not only timely but also one of the trendiest foods of the year: Meatballs! Meatballs most often are associated with a bowl of pasta, and that’s a good thing if you’re in the mood for something warm and saucy. But what if you’re thinking “gourmet” instead of “Italian grandma”? You’re in luck, because the humble meatball is suddenly on a sophisticated roll. Following in the trendy footsteps of the cupcake and miniature doughnut, these bite-sized balls of comfort food are popping up on menus in a variety of forms and sizes. And while ground beef very often is the foundation, other meats and also fish and seafood are making their way into the grinder. One of the most requested menu items at the popular Meatball Shop in Manhattan’s Lower East Side are the Spicy Pork Balls, a tongue-tickling marriage of ground pork shoulder and red hot cherry peppers. The restaurant also makes balls from salmon, duck, corned beef, shrimp, venison and — brace yourself — rabbit. They’re called “bunny balls,” and served with mushroom gravy on mashed potatoes. Naturally he took the idea and ran with it — what chef worth his weight in ground beef or pork wouldn’t? — putting Mediterrean-style balls on the appetizer menu at Casbah. They’re served on Anson Mills polenta with another current culinary darling, crispy brussels sprouts. Some other tasty local examples include the grilled pork meatballs at Pusadee’s Garden in Lawrenceville, which come on sugar cane skewers with a lemongrass-tamarind dipping sauce, and the Polpette di Rapini at Girasole in Shadyside: meatballs made with prosciutto and chilis and served over broccoli rabe. Happily for cook-it-yourselfers, it’s not just a restaurant thing. Meatball madness has spread to home kitchens via a handful of new cookbooks, including one from the owners of the Meatball Shop, that take the rustic dish to mouth-watering new heights. Simmered in sauce, grilled in a basket over a charcoal fire, breaded and deep-fried to a crisp, or steamed to meaty deliciousness in a bamboo steamer — chances are there’s a meatball with your name on it just waiting to be tasted. Meatballs are particularly good this time of year because they’re relatively inexpensive and can be made either golf-ball sized (for dinner) or bite-sized (as an appetizer) for your holiday get-together. They’re also super easy: Make them in advance and cook them up to 24 hours later, or bake them up to three days ahead of time and simply reheat in the oven or microwave just before serving, with or without sauce. The possibilities are endless. Time to get rolling. My kids liked these Japanese-inspired meatballs so much I had to make them twice, with extra sauce for dipping. Terrific as a finger food but equally delicious tossed with soba noodles. To make meatballs, combine chicken, panko, egg, scallion, cornstarch, ginger, soy sauce, salt and pepper in a large bowl and mix well. Cover and refrigerate for at least 15 minutes or up to 4 hours. Bring 2 quarts of water and sliced ginger to a boil in a pot over high heat. Reduce heat to medium low to keep it as a simmer. Using wet hands rinsed under cold water, shape chicken mixture into 20 meatballs. Transfer to a baking sheet, then carefully add the balls to the pot. Simmer until cooked through, about 6 minutes. While balls are cooking, make teriyaki sauce by bringing soy sauce, mirin, sugar and rice vinegar to a boil in medium saucepan over high heat. Boil until thickened and reduced to about 2/3 cup, about 5 minutes. Pour into a bowl. Using a wire spider or sieve, remove meatballs from cooking liquid. Drain briefly on paper towels. Serve with toothpicks and sauce. Chipotle chiles in adobo sauce give these meatballs plenty of heat. Put onion in food processor and process to a puree. Scrap onion into a large mixing bowl and stir in chipotles and their adobo, garlic, mint and cilantro. Crumble ground pork into bowl and mix well with onion mixture using your hands. Add bread crumbs, egg, cheese, salt, pepper and 3 tablespoons water and mix well. Shape mix into 11/2-inch meatballs, lining them up on a rimmed baking sheet as you go. Bake until meatballs are cooked through and lightly browned, 15 to 20 minutes. 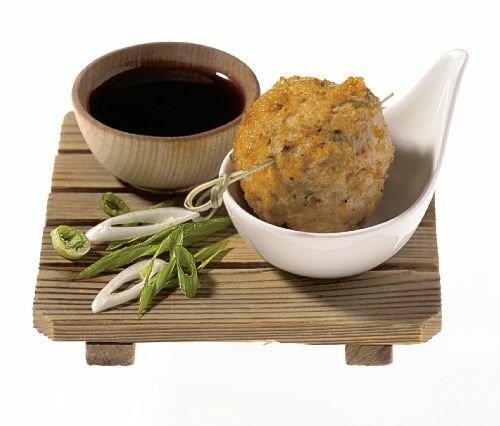 Serve meatballs hot, with some of the sauce for dipping and decorative wooden picks or skewers for spearing the meatballs. Ground cinnamon and fresh mint give these Greek meatballs, called keftedes, their unique flavor. In a small bowl, combine bread crumbs and 1 cup of half-and-half and let soak for 5 minutes. Meanwhile, in a skillet, melt 4 tablespoons over heat, add onions and garlic, and stir until softened, about 8 minutes. Transfer onions and garlic to a large bowl, add soaked bread crumbs plus the 2 meats, and mix with hands until well blended. Add the remaining 1/2 cup half-and-half, the eggs, cinnamon, half the mint, and salt and pepper, and continue mixing until well blended. Form mixture into balls 1 inch in diameter and dust lightly in the flour. In a large skillet, melt remaining 4 tablespoons butter over moderate heat and add the oil. Add meatball in batches and brown on all sides, about 10 minutes. Drain on paper towels, transfer to platter and keep hot in oven until ready to serve in a heated bowl topped with remaining chopped mint. Who says meatballs have to be include meat? This vegetarian version is made with lentils and mushrooms. 1/4 cup grated parmesan cheese >To make meatballs, combine the lentils and 2 quarts water in a medium stockpot and bring to a boil over high heat. Reduce the heat to low and simmer until the lentils are soft but not falling apart, about 25 minutes. Drain the lentils and allow to cool. Add 1/4 cup of the olive oil to a large frying pan and saute the onions, carrots, celery, garlic, thyme and salt over medium-high heat, stirring frequently, for about 10 minutes, until the vegetables are tender and just beginning to brown. Add the tomato paste and continue to cook, stirring constantly, for 3 minutes. Add the mushrooms and cook, stirring frequently, for 15 more minutes, or until all the liquid is absorbed. Transfer the mixture to a large bowl and allow to cool to room temperature. When cool, add the lentils to the vegetable mixture. Roll the mixture into round golf ball-sized meatballs (about 11/2 inches), making sure to pack the vegetable mixture firmly. Place the balls in the prepared baking dish, allowing 1/4 inch of space between the balls and in even rows vertically and horizontally to form a grid. Roast for 30 minutes, or until the meatballs are firm and cooked through. Allow the meatballs to cool for 5 minutes in the baking dish. To make pesto, fill a large stockpot 3/4 full with water and bring to a boil over high heat. Fill a large bowl with ice and water, and set aside. When water is boiling, add spinach and basil and stir. After 1 minute, strain the greens, and plunge into ice water. Drain again and squeeze them tightly to get as much water out as possible. Chop greens roughly. Combine greens and nuts with salt, olive oil and parmesan in a food processor, and process until a smooth consistency is reached. Taste and season with additional salt, if desired. Makes about 2 dozen 11/2-inch meatballs and 4 cups pesto. Serve these communally, right from the skillet, as the residual heat helps keep them warm. Offer with lots of crusty bread to wipe up every last drop of sauce. To make meatballs, combine ground meats, bread crumbs, egg, garlic, paprika, salt and pepper in a large bowl and mix well. Cover and refrigerate for at least 15 minutes or up to 4 hours. Using wet hands rinsed under cold water, shape the mixture into 32 equal small (one bite) meatballs. Transfer to baking sheet. Heat oil in a large nonstick skillet over medium heat. In batches, roll meatballs in flour to coat, shaking off excess flour. Add meatballs to skillet and cook, turning occasionally and adding more oil as needed, until lightly browned on all sides, about 5 minutes. Transfer to a plate. To make sauce, let skillet cool for a few minutes. Add oil and garlic to the skillet. Stir over low heat until garlic softens, about 1 minute. Add sherry and increase the heat to high. Bring to a boil, scraping up browned bits in the skillet with a wooden spoon. Stir in broth. Return meatballs to skillet and reduce heat to medium-low. Cover and simmer until meatballs are cooked through and sauce is lightly thickened, about 10 minutes. Season sauce with salt and pepper. 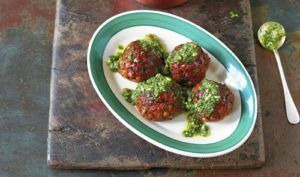 Sprinkle meatballs with parsley and serve, directly from the skillet, with toothpicks for spearing. These taste exactly like the classic sandwich, only with none of the mess. I used marbled rye and added a bit more caraway seed. Preheat oven to 450 degrees. Drizzle olive oil into a 9 by 13 inch baking dish and use your hand to coat the entire surface. Set aside. Combine remaining ingredients in a large mixing bowl and mix by hand until thoroughly incorporated. Roll mixture into round, golf ball-sized balls (about 11/2 inches), making sure to pack the meat firmly. Place balls in prepared dish, being careful to line them up snugly in even rows to form a grid. Meatballs should be touching one another. Roast for 20 minutes, or until meatballs are firm and cooked through (a meat thermometer inserted into the center of a meatball should read 165 degrees). Allow meatballs to cool for 5 minutes in baking dish before serving with Thousand Island dressing for dipping. These appetizer-sized meatballs are served with a nest of spaghetti on top. Make pasta sauce by placing carrot, celery, shallot, bay leaf, garlic and cinnamon stick in a small saucepan. Cover with cream. Bring to simmer over medium heat. Reduce heat to medium-low and simmer until reduced by one third, about 20 minutes. Strain sauce through a fine-mesh sieve (discard solids) into medium bowl, then pour back into saucepan. Set over low heat. Melt butter in another small saucepan over medium heat. Whisk in flour and cook, stirring constantly, until paste is straw colored, about 30 seconds. Whisk in reduced pasta sauce in a slow, steady stream. Once a few bubbles burst at the surface, season with salt and pepper and remove from heat. Make meatballs by heating olive oil in a medium nonstick skillet over medium heat. Add shallot and cook, stirring often, until translucent, 3 to 4 minutes. Stir in garlic and cook until fragrant, about 30 seconds. Turn off heat and scrape mixture into a large bowl to cool. Once shallot mixture is cool, whisk in egg, heavy cream, parmesan cheese, tomato paste, port, salt and pepper to taste. Add ground beef and mix gently with hands until well combined. Shape mixture into tablespoon-sized balls and place in a baking dish. Pour beef broth into baking dish, cover with foil and bake until meatballs are cooked through, 7 to 10 minutes. Remove dish from oven, discard foil and let meatballs cool to room temperature. Slice a small bit off the top and bottom of each meatball to create a flat surface, then place meatballs on a serving platter. Reheat pasta sauce over medium-low heat until warm. Stick a fork into a pile of pasta and twirl to make a 3- or 4-strand nest. Dip the nest into warm pasta sauce and then carefully slide it off fork and onto meatball. Repeat with remaining meatballs. Finish each meatball with a dollop of pureed marinara sauce, some parmesan and chopped parsley. Transfer to a platter and serve. New Year’s, the biggest party night of the year, is just a little over a week away, and hosts across the globe will be looking for that one special beverage to keep their guests smiling — and sipping — until the ball drops at midnight, if not well after. Tradition holds there will be some sort of bubbly with which to ring in 2012. My vote goes to an extra-dry prosecco, a sparkling Italian white wine that has soared in popularity in recent years, and which I love served in a tall and narrow flute so the nose-tickling bubbles and aromas stay inside the glass. Still, nothing sets the party scene like a pretty signature cocktail. A drink doesn’t have to be fussy to impress your party guests, or made with exotic ingredients you’ll have a hard time finding (and probably won’t use again until your next party). It simply has to be fresh and delicious. Then again, on this night in particular, when revelers are in an especially festive mood and any resolutions to lose weight or eat a better diet are still at least a day away from being tested, no one’s going to complain if the drink in his or her hand is a bit more “fun” than usual. A spoonful of pomegranate arils, for example, will add crunch along with visual interest to a glass of sparkling wine, and a bartender never can go wrong by garnishing a drink with a long curlicue of citrus peel. Or a slice of fresh fruit, for that matter. Another easy and inexpensive way to dress up a sweet cocktail (and when you’re the hostess, “easy” is important) is to rim the glass with a little fruit juice and then dip it into granulated sugar or crushed hard candy. Consider it the cocktail version of a sequined blouse or glittery party hat. It’s New Year’s Eve, after all, when everything and anything is possible! Start your calorie-counting the next day. This bubbly pink cocktail is definitely worth the stained fingers a pomegranate always seems to entail. I substituted prosecco just because I love it, but any sparkling wine will do. To make each drink, pour 3 tablespoons (11/2 ounces) liqueur into a flute. Gently pour 1/2 cup (4 ounces) sparkling wine over the liqueur. Add 1 1/2 teaspoons pomegranate seeds and serve immediately. Cafe Notte in Emsworth uses Danny DeVito’s limoncello, an Italian lemon liqueur, in this sweet-sour holiday cocktail. For a more elegant presentation, take a chilled martini glass, run a lemon wedge around the rim, and then dip the glass into a plate of fine sugar. Lemon twist for garnish >Fill cocktail shaker halfway with ice. Add limoncello, vodka and simple syrup. Shake.Strain and pour the cocktail into a chilled martini glass. Garnish with a lemon peel.Makes 1 drink. Mix berries, basil, sugar and vodka together in a container, and let it sit in fridge for a few hours or overnight to allow the sugar to dissolve. To serve, place a tablespoon of the berry mixture in bottom of glass. Top with prosecco and serve. Yum! Seeing not everyone imbibes, and ginger ale is oh-so-boring, you’ll probably need at least one tasty mocktail to ring in the New Year. This festive recipe showcases some favorite seasonal fruits kids love and as a plus, is packed with antioxidants. Consider it a preemptive strike on 2012. In a large pitcher, combine cherry juice, pomegranate seeds, orange, apple and maple syrup. Refrigerate for 1 hour or overnight. Stir in seltzer and ginger ale. Serve over ice. This will help break the ice on a chilly New Year’s Day. Pour apple cider into a medium pot. Heat to boiling then reduce to a very low simmer (no more than a lazy bubble or 2). While it comes to a boil, wrap seasonings in cheesecloth and tie with kitchen twine (this is optional but makes it easier to take them out). Place seasoning packet in apple cider. Mostly cover and simmer for 30 minutes to an hour, or until apple cider has reached desired level of spice. Can serve hot or chilled. Add a shot of bourbon or rum to a 6-ounce pour of cider for a delicious seasonal cocktail. Makes about 10 6-ounce drinks. This warming drink has all the flavor of the classic red version, but is lighter in body. Peel orange in strips using a vegetable peeler, being careful not to remove any pitch. Push cloves into peel. Combine clove-studded peel, star anise, ginger, water and sugar in a saucepan over medium heat. Bring to a simmer, stirring to dissolve sugar, and cook for 10 minutes. Remove from heat and add wine. Let stand for 20 minutes to mull. Just before serving, gently reheat mulled wine over medium heat until just beginning to simmer. Serve warm. 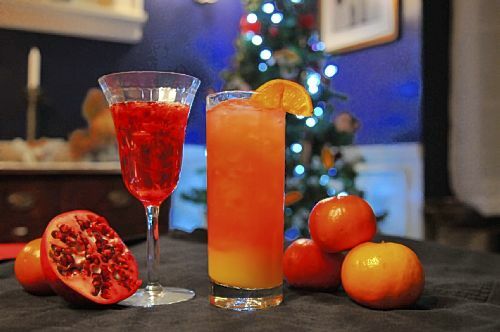 With its colorful swirl of orange and red, the drink is as festive as it is fresh. Best of all, it can made quickly — no small thing for a busy host. Some groceries carry fresh-squeezed tangerine juice, but it’s just as easy to make your own. Serve with a long curl of peel or a slice of tangerine on the rim of a highball glass. These are pretty with or without the frosted glasses. Juice 12 of the tangerines and chill the juice. Cut the remaining 2 tangerines into 1/8-inch slices. Fill 8 highball glasses with ice and place 2 tangerine slices in each glass and fill the glass to 2/3 full with soda water. Pour in Campari to fill the glass and float 1 or more tangerine slices on top. This vermouth-based cocktail is made with fresh pineapple. Best served in a frosted martini glass. Chill martini glasses in the freezer until very cold. Place the pineapple in a blender with half of the vermouth. Blend until smooth and pour, over ice, into the martini glasses, garnish with sprigs of tarragon, top each glass with a splash of vermouth and serve. Cranberry sauce is kind of like stinky cheeses. You either can’t get enough of the stuff, or you can’t get it far enough away from your plate. Most of us fall into the first category. Americans will gobble up some 5 million gallons of the sweet-tart sauce during the holiday season alone, or enough to fill five of those giant balloons in the Macy’s Thanksgiving Day Parade. Most of it will be served directly out of the can at room temperature, without the slightest attempt to disguise the can’s seam lines. My running buddy Tracey is one such devotee. She might dress up its presentation in her grandmother’s crystal bowl after cutting the gelatinous roll into 1/2-inch-thick slices, but basically, it’s plop to plate each year. I’m not one to argue with tradition, especially when it involves antique glassware and the approval of more than 74 percent of Americans (that’s how many serve store-bought sauce at Thanksgiving dinner). Still. If you’re among the ruby fruit haters, maybe it’s because you’ve never had a really good fresh homemade cranberry sauce. This week, in the last of our four-part series on Thanksgiving dishes, we offer four recipes that are guaranteed to change your mind about from-scratch cranberry sauces: three that are cooked, and one that celebrates the raw berry, a staple in the Native American diet since at least the 1500s. They’re easy enough, and with such pretty results, that even the beginning cook will look like a culinary genius. Think about it this way: The Pilgrims probably weren’t crazy about the wild cranberries dished up by their new friends at the first Thanksgiving in Plymouth in 1621, either. But by 1703, it was a popular enough dish that cranberries were served at the Harvard University commencement dinner. All those smart people can’t be wrong, right? This classic cooked sauce is flavored with just a hint of cinnamon and orange zest. So easy, and so fantastic. In a heavy-bottomed saucepan, combine cranberries, orange juice, sugar, orange zest, cinnamon stick and salt and bring to a boil over medium heat. Reduce heat to low and simmer until sauce has thickened and all of the berries have burst, about 15 minutes. Remove from heat, let cool and remove and discard cinnamon stick. Serve immediately, or cover and refrigerate for up to 4 days (bring to room temperature before serving). The onion and spices make this a savory twist on the usual cranberry sauce. If you’re looking for something just a little different this year, this could be your answer. The golden raisins plump up and give the chutney a nice texture. In a large saucepan, combine cranberries, apple, orange segments and juice, raisins and chopped onion. Add brown sugar, spices and salt to the mixture. Bring to a boil over medium heat and cook, stirring often, for about 20 minutes, or until thick and bubbly. Remove pan from heat and allow chutney to cool completely. Serve right away, and store any leftovers in the refrigerator for up to 2 weeks. Melt butter in a medium saucepan over medium heat until it foams. Toss in shallot and saute until soft, about 2 minutes. Season with a touch of salt. Stir in raisins, cranberries, orange juice, water, sugar and chipotle pepper, and bring to a boil. Reduce heat and simmer, stirring on occasion, for 15 minutes. Let cool to room temperature and refrigerate at least 30 minutes until ready to serve. To show off the tangy freshness of cranberries, don’t cook them at all. Chopping the raw berries in the processor gives them a coarse texture, which is great alongside the turkey and the trimmings. Plus, the recipe comes together in 20 minutes. Place cranberries in processor. Using on/off turns, process until finely chopped. Transfer to bowl. Add onions, cilantro and chiles. Stir together sugar and lime juice in another bowl until sugar dissolves. Cranberry and lime juice mixtures can be made 4 hours ahead. Cover separately; chill.